What does disaster capitalism really look like in the 21st century? In the last 7+ years, I’ve been investigating and reporting on disaster capitalism around the world. This culminated in my book, Disaster Capitalism: Making A Killing Out Of Catastrophe, and the documentary, Disaster Capitalism. 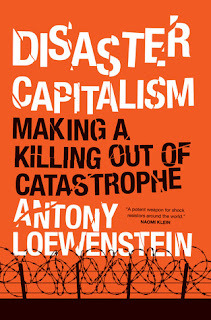 That there are many cases of disaster capitalism is a point made by journalist Antony Loewenstein in his book, Disaster Capitalism: Making a Killing out of Catastrophe (2015), and in the 2018 documentary Disaster Capitalism. In these comprehensive and unsettling works, he covers war (in Afghanistan), aid (in Haiti following the 2010 earthquake), and environmental exploitation (in Papua New Guinea). He also cites many other examples of exploitative economic practices—those that aim to make money for corporations or purposefully impoverish citizens—in Greece, the UK, the US, and Australia. Early on in the book, Loewenstein makes an important terminological point: “Whether we call this disaster capitalism,” he writes, “or just a product of the unavoidable excesses and inequalities of capitalism itself, the end result is still a world ruled by unaccountable markets.” Although Loewenstein neglects to flesh this out, it is a crucial observation: what he sees in disparate locations and contexts is not necessarily produced or predicated by a disaster or extraordinary event. The crisis that Loewenstein documents pervades capitalist societies and lies in actors systematically embracing exploitative and damaging practices in the unfolding of the neoliberal story. Be it detention centers in the US, relief aid in Haiti, military contractors in Afghanistan, economic sanctions on Greece, complicit corporate-sponsored NGOs in the developing world, or prison systems across much of the Western world, “predatory behavior” does vary “from country to country, but the strategy is the same: exaggerate a threat, man-made or natural, and let loose unaccountable private-sector contractors to exploit it.” Loewenstein frequently uses the term “disaster” seemingly interchangeably with terms like “exploitative,” “crisis,” and “predatory” as descriptors of capitalism. That he settles on no single word is not a weakness, but rather an intriguing diagnosis: capitalism in its current expression and at its worst is all of those things and more. Once you pry open the terminology a little bit, as Loewenstein implies, one finds that the leverage of “disaster capitalism” now stretches far beyond that which Klein identified. In Loewenstein’s reckoning, there are still the more “traditional” disasters and economic shock therapy “solutions,” and perhaps it is those more obvious shocks that generate the conditions that allow for a particularly nefarious and obvious expression of largely harmful neoliberal capitalism, as is beginning to unfold in Puerto Rico. In the background, however, a more unsettling picture also emerges, in which those exploitative machinations continue to take hold, progressively and aggressively, even without a disaster or shock. Indeed, after reading Loewenstein’s book, one is left wondering what isn’t impacted by the nefarious tendrils of “disaster” capitalism—education, the aid system, non-profit organizations, the democratic electoral system, privacy, healthcare, big tech, big data, underemployment. Nothing is safe from the imperial reach of a commodified system of capital. Disaster or not, it now seems that capitalism seeks to get into unexplored cracks and expand whether or not we like or even recognize it. A disaster often serves to foreground these ever-present traits. As such, “disaster” may no longer refer to specific shocks or changes in the economic system but rather to the system itself. “Disaster” can serve as a modifier concerning the very nature of capitalism and its development within a broad framework of neoliberalism. That is, it is inherently disastrous and in crisis, not exceptionally. Loewenstein interviewed Assange in 2008 on the efforts that were already underway to silence WikiLeaks due to its publication of information that whistleblowers wanted known to the world. Since 2010, he has been prominent in defending Assangeagainst the persecution he has faced for publishing leaks that exposed US war crimes in Iraq and Afghanistan, along with the anti-democratic intrigues of governments around the world. Loewenstein’s articles on WikiLeaks are available on his website. This year, Loewenstein released a documentary, “Disaster Capitalism,” which is a critical exposure of the global aid and investment industry. See here for information and screening locations. Back in 1972 Jørgen Randers, today the professor of climate strategy at the Norwegian Business School, published a book called The Limits to Growth. He warned of the devastating impact of population and economic growth on a world of limited resources. Revisiting that prognosis in a 2004 essay, he found that his predictions were correct and that global leaders had been much remiss in ignoring the urgent need to battle unsustainable development. Randers’ key argument was a challenge to the inherent rules of capitalism. By 2015, he was pessimistic that the current financial order was capable of — or even had any interest in — reducing the devastating effects of climate change. “It is cost-effective to postpone global climate action,” he wrote. To encourage a country such as Norway to tax every citizen, his suggested solution was for people to pay an extra 250 euros every year for a generation, thereby drastically cutting greenhouse gases and providing an example to other industrialized nations. The idea never got off the ground. “The capitalist system does not help,” Randers explained. Although Randers pushed the worrying idea of “enlightened dictatorship” — “for a limited time period in critical policy areas” — his thesis strikes at the heart of why wealth is concentrated in so few hands in today’s world: there is little incentive to advocate for a more equitable planet. The market system guarantees unfairness and rewards greed. Such debates are starting to emerge even among the class who most benefits from such inequality. During the annual conference in Davos, Switzerland, in 2015, where the world’s business and political leaders gather to congratulate themselves, some sessions concluded that inequality was a serious problem facing the globe, and participants were pessimistic about solving it. Such talk was a start, but hardly enough when the dictator Abdel Fattah al-Sisi, the Egyptian president — a man responsible for the death of thousands of his own people — was warmly welcomed in Davos and allowed to pontificate about his vision for “sustainable development.” Human rights and economic freedom must not be mutually exclusive concepts. The figures speak for themselves. The share of wealth in the US owned by its richest 0.01 percent has quadrupled since the eve of the Reagan Revolution. The top 1 percent of the world’s population owns 46 percent of all global assets. US cuts in food stamps have left the nation’s largest food bank, in New York, struggling to cope with demand. Around 16.5 percent of the state’s population requires emergency food assistance. In 2013, roughly 14 percent of the country’s population “lacked access to enough food for an active, healthy life for all household members,” according to the US Department of Agriculture — a 30 percent increase since 2007. The US middle class, long viewed as the globe’s most successful, now suffers growing income inequality. A crucial factor in this decline has been the failure of educational attainment to progress as successfully as in other industrialized states. This is the modern definition of capitalism. As Taibbi told those attending an Occupy Wall Street day of action in 2012, “this gigantic financial institution is the ultimate symbol of a new kind of corruption at the highest levels of American society: a tendency to marry the near-limitless power of the federal government with increasingly concentrated, increasingly unaccountable private financial interests.” Wall Street bankers were happy. The sum of all executive bonuses in 2014, averaging roughly $173,000 each, came to around double the earnings of all Americans working full-time on the minimum wage. It is an ideology that thrives despite guaranteeing social disharmony. The US model of reducing the role of government while increasing the influence of largely private power has never been so rapacious, though the problem is global. For-profit colleges burden students with huge debts and worthless credentials while receiving federal student aid. Goldman Sachs, a firm with a large measure of responsibility for the economic meltdown in 2008, now invests in social-impact bonds — a system that enriches the company if former prisoners stay out of jail but reduces the accountability of governments and prioritizes private profit. The corporation also makes money from higher education, pressuring underprivileged students to take on debt while giving scant attention to the standard of teaching. Republicans in Michigan have pushed for the privatization of public school teachers, using a skewed logic that advocates cutting public schools and selling off facilities at the lowest price. Many tolls operating on public roads and highways in the US service the bottom lines of local and multinational companies. Public libraries have been outsourced, reducing employee salaries or eliminating jobs. In Europe, many corporations and lawyers shamelessly exploit international investment deals to derive profits from suing crisis-ridden nations. Market speculators pressurize fragile nations such as Greece, whose citizens are forced to survive with fewer public services. British citizens living on the margins face eviction or spiraling rent increases because global fund managers, such as Westbrook — based in the United States — purchase homes as assets to be milked for profit. The International Monetary Fund (IMF) traverses the world with the backing of Western elites, strong-arming nations into privatizing their resources and opening up their markets to multi- nationals. Resistance to this bitter medicine is only one reason that large swathes of Latin America have become more independent since the 2000s. The mass privatization that results — a central plank of US foreign policy — guarantees corruption in autocracies. Wikileaks’ State Department cables offer countless examples of this, including in Egypt under former president Hosni Mubarak. The World Bank is equally complicit and equally unaccountable. In 2015 it admitted that it had no idea how many people had been forced off their lands around the world due to its resettlement policies. The story barely made the news and no heads rolled. One Californian town, Maywood, took the privatization memo a bit too seriously. It literally outsourced everything in 2010, sacking all municipal workers, including the police department, due to budgetary pressure. “We will become 100 percent a contracted city,” said Angela Spaccia, Maywood’s interim city manager. Although Occupy was dismissed as an irritant and irrelevant by many on Wall Street and in the corporate media, police unleashed a sophisticated surveillance operation to disrupt the protestors. They recognized the danger represented by the threat of a good idea. The challenge faced by opponents of rampant capitalism was how to focus their rage coherently against increasingly pervasive forces. The study of capitalism is soaring at universities across America, indicating the desire on the part of tomorrow’s graduates to understand the tenuous connection between democracy and the capitalist economy. The phenomenal success of French economist Thomas Piketty’s book Capital in the Twenty-First Century — a work arguing that social discord is the likely outcome of surging financial inequality — indicates that the public knows there is a problem and is in search of clear accounts of it. Piketty advocates a global system of taxation on private property. “This is the only civilized solution,” he told the Observer newspaper. In 2014, even the world’s leading economic think-tank, the Paris-based Organization for Economic Cooperation and Development, urged higher taxes for the rich to help the bottom 40 percent of the population. When establishment magazine Foreign Policy publishes an article by the US managing editor of the Financial Times, Gillian Tett, which closes expressing a wish for an “honest debate” about “wealth redistribution,” it is clear that the world has gone a little mad. Toward the end of my undergraduate career, I found myself at a crossroads. As a communication major, my professional outlook was open to diverse challenges while experientially oblique. I also longed for a master’s degree that would increase my prospects for a productive future. Across campus from my main building, an advisory meeting took place between myself and a graduate liaison; the purpose was to learn more about the college’s M.A. in “Parks and Recreational Management”. The meeting took place during the peak years of public support for the “War on Terror”, and even in Higher Education, rumors of a prosperous life overseas amidst the tumult ranged from conventional to inventive. The advisor nearly talked me into the master’s program on the prospect that I could instantly translate the degree into a gym management position in Bagdad, Iraq, getting paid (with a signing bonus!) to “work out and man the desk” for a start of about $80k a year. The dream seemed a little too good to be true and arguably less safe than I was comfortable with then. Who knows what misadventures (and hidden fortunes) this path could have lead to if I had chosen to “follow the money” to the Middle East. 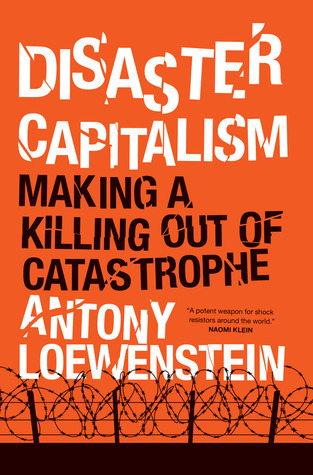 In Disaster Capitalism: Making a Killing Out of Catastrophe, veteran war journalist and political activist Antony Loewenstein paints an essential portrait of post-9/11 globalism where he frames war and natural disaster crises as among the most coveted commodities facing mass exploitation for financial gain. At first, the “Introduction” to Disaster Capitalismreads like a dense scholarly polemic. Loewenstein combines critical-cultural history that intertwines the post-9/11 “War on Terror” geopolitical spectrum with the dozens of mediated natural disasters around the world. To compound these seemingly disparate narratives, the author employs a bevy of neoMarxian terms that ultimately assess and critique the diverse roles profit and privatization provide in times of war and crisis. Unlike many critical scholars, however, Loewenstein does not write from a bubble. He reports from the front lines and with the painstaking details of a field ethnographer. The vivid description helps paint a picture as lifelike as the “thrilling” programs that dramatize wartime crisis and intrigue. The author also knows, reads, and references his contemporaries. He infuses political science discourse initiated by Canadian journalist Naomi Klein throughout the text. Klein is an innovator on this subject, having authored 2007’s influential The Shock Doctrines: The Rise of Disaster Capitalism (Canada: Knopf Canada) as well as This Changes Everything: Capitalism vs. The Climate (New York: Simon & Shuster, 2014). precursors to the Wikileaks phenomenon and efforts to push against State-funded neocolonialism for the last remaining resources in recorded history. Among the many post-apocalyptic terms in play, “Mad Max economy” (8) is suggested as a way of understanding how the militant anarchy over regions and resources have unfolded, even stateside crises in the US, like when Hurricane Sandy devastated parts of the northeast. Loewenstein thus embarks on a labyrinthine journey to explore and explain the contemporary globalized military industrial complex. It’s a macroeconomics lesson crafted on a microeconomics scale of interpersonal relationships and firsthand conversations. The author defines his preeminent term “disaster capitalism” as “a product of unavoidable excesses and inequalities of capitalism” where the status quo supports “a world rules by unaccountable markets.” (9) He follows the trail of previous and fellow journalists, the last cabal of ideological holdouts in an age of compromised media bias. Every key term links back with the author’s critique of unchecked capitalism and the evolution towards a world controlled by corporate interests and resource allocation. From “environmental vandalism” (9) to “vulture capitalism” and “predatory capitalism” (11), the picture painted is a dire one; that is, if readers don’t get lost in the author’s adventurous and descriptive prose. The bulk of Disaster Capitalism is split into a series of chapters that document Loewenstein’s wartime travelogue between devastated regions of prominent and “third world” status, including Pakistan and Afghanistan, Greece, Haiti, and Papua New Guinea. The author then subverts the neocolonial war-torn/disaster emphasis by returning to Western nation-states for a homeland assessment of mass privatization. These chapters include tackling government outsourcing of private detention centers, renaming of mercenary services for maximum corporate efficiency and political correctness, and the big business of disaster capitalism for countries like the US, Great Britain, and Australia. In some ways Loewenstein cleverly embeds the main text in a hybrid between field journalism and descriptive prose. It’s easy to imagine the average non-academic readers skipping the Critical introduction altogether and becoming immersed in the seductive details of the main text chapters (say, “that holiday gift for someone special” that prefers Bill O’Reilly’s “Killing” series of interpretive histories). One can almost sense the perceived bias among readers to conjure dueling interpretations of the text. On one hand, there’s the overt message of capitalism gone awry and unchecked power spiraling upward in a pyramid of hierarchical profit mongering. This reading of the text aligns with the author’s intent and purpose. On the other hand, vivid details could appeal to more aggressive demographic, including personal recollections from many embedded with multi-national organizations with elite access and steep compensation, private military contractors living out sustained hardship and deadly lifestyles, and the booming economics of post-military careers supported by war profiteering. No doubt these contemporary swashbucklers make a strong appeal even to those tamed by modernity and “Western civilization”. Certainly, an untrained eye could easily misinterpret the author’s main text, translating his message into a specialized tunnel vision where reader eyeballs transform into dollar signs. Ideological lines often blur for many Americans struggling through the first world doldrums of costly insurance coverage, student loans, mortgages, retirement, compounded by conflicted fears and concerns of antagonists abroad, both legitimate and “produced”. Ultimately, Loewenstein rages against the machine with calculated conviction, the recalled minutiae of his collective thoughts a harbinger for the tectonic plates of nation-states already in motion. The Space Race has become a resource game, both for short-term monetary gain and with the long-term efforts to secure and privatize the last of the world’s untapped resources—a stark reality to face, indeed. Given the overarching economic framework setting up his post-global outlook, the Mad Max worldview starts to sound downright nostalgic by comparison. In hindsight, the $80k paycheck (plus signing bonus!) I would have received just to manage gyms for wartime correspondents and military personnel might have been a drop in the hat compared to future heightened economic advantages and networked relationships to prosper from. Then again, the ability to closely read both overt and covert aspects of Loewenstein’s Disaster Capitalism offers a fraction of the bounty I gained in scholarly expertise while advancing an alternative educational pipeline of my own. In January, my book, Disaster Capitalism: Making A Killing Out Of Catastrophe, was published globally in a paperback edition by Verso. The unaccountability of privatised immigration had rarely been so brazen. Australia is the only country in the world to have fully outsourced the detention of all asylum seekers to the private sector. In January, its officials were found to have spent $2.2 billion on offshore detention without necessary authorisation. The Australian National Audit Office damned the Department of Immigration and Border Protection for handing out contracts to corporations on Manus Island in Papua New Guinea and Nauru in the Pacific that established dangerous and excessively expensive facilities. The story broke over a long, hot Australian summer. After a few days of headlines, the issue disappeared down the memory hole. No ministers or authorities were fired or reprimanded. Although the wasted billions of dollars were taxpayers money, the public outcry was almost non-existent because many Australians supported its country’s draconian treatment of refugees in far-away, secretive camps. Almost any amount of money is justified to manage these fears and prejudices. Occasionally, journalists report from Manus Island, including Roger Cohen from the New York Times, who reveal the horrors inflicted by indefinite detention on the hundreds of refugees trapped there for years, but too few reporters make the journey. For more than 20 years, Australia has devised increasingly harsh penalties for asylum seekers who claim their legitimate right to request asylum when fleeing repressive regimes. These are often states that the Australian government has waged war against such as Iraq and Afghanistan. Corporations such as Serco, G4S, Ferrovial and International Health and Medical Services, amongst many others, have made huge amounts of money from the warehousing of refugees despite decades of evidence proving inadequacy and criminality. Boycotting and targeting these firms should be the priority for every committed citizen. The political winds around the world in 2017 indicate a hardening of minds and hearts towards refugees and Australia has become a global model in how to isolate, target, privatise and demonise asylum seekers. The EU now wants to establish centres in northern Africa, including in war-torn Libya, to process refugees. This is a carbon copy of Australia’s off-shoring of asylum seekers in remote locations away from prying media. It’s not hard to see why. In the last few years, many European leaders and the European Union made a conscious decision to belittle asylum seekers and make their lives miserable. Unaccountability rules. In my book, Disaster Capitalism, I investigate the reality for refugees in Britain and Greece during these challenging times. It’s only getting worse. Think of the recent, shocking images of refugees freezing and dying in the Balkans and Greece, unwanted and ignored. Furthermore, security fences are being built on many European borders, benefitting private firms with the expertise in building them (including from Israel with years of caging Palestinians). The Israelification of security is already upon us, with Western police and army getting training from Israeli forces who have decades of experience occupying, targeting and isolating Palestinians in the West Bank and Gaza. In the last years, Israeli firms have expanded their global reach, exploiting the worldwide desire to copy the Jewish state’s treatment of minorities and its own Arab citizens. The Trump administration is likely to hire Israeli companies to build a wall along the Mexican border. Mistreating refugees rarely incurs a political price in the 21st century. From Britain to Australia and Afghanistan to Germany, officials are increasingly tasked to look “tough” in the face of legitimate asylum claims. Far-right populism, infused with rampant nationalism, patriotism and anger, has supplanted any strong and viable left-wing alternatives. There are exceptions, of course, but the current worldview trend is towards insularity and punishment of the least fortunate. President Donald Trump’s announcement to withhold visas for people coming from select Muslims nations – not coincidentally places that the US has bombed for years – is not affecting close US-allies like Pakistan and Saudi Arabia with a higher level of extremism. Along with aggressively kicking out refugees already in the US – many of whom are fleeing US-backed, repressive states such as Honduras, where I visited last year – Trump and his government are heralding an extreme version of disaster capitalism. Private prison companies are licking their lipswith joy. Rich Silicon Valley types are preparing for the end of the world by buying living quarters in redesigned, underground nuclear bunkers. Their tech utopianism apparently has its limits; they fear societal breakdown. Since my book Disaster Capitalism was released in 2015, I’ve witnessed the deterioration of refugee rights across the world and growing hatred towards them. Corporations sense the public mood and political opportunity and behave accordingly. For example, European Homecare (EHC) is a German company employed by the German government to manage asylum seekers but it’s been engulfed by scandal. In late 2016, a Syrian refuge living near Dusseldorf emailed me information, photos and videos about the abuses being committed by EHC that he had personally witnessed when in detention. In an age of walls, militarised fences and attacking minority rights, refugees are both the most vulnerable and easiest target for insecure populations and desperate politicians. Rich, Western democracies sending back asylum seekers to danger, a trend perfected by Israel, Australia, Britain and Germany despite its illegality, is surging. It’s why civil disobedience, company boycotts and divestment and more direct action is essential to resist the global war on asylum seekers. It’s unsurprising that nations with a colonial past, such as Australia, Britain, the US and Israel, are leaders of the pack. Antony Loewenstein is a Jerusalem-based, independent journalist who has written for the Guardian, the New York Times and many others. He is the author of many books including his most recent, Disaster Capitalism: Making a Killing Out of Catastrophe, now out in paperback. The US Presidential Election is in full swing. Over the next few months, Donald Trump and Hillary Clinton will go toe-to-toe in what is already a less than clean scrap. In amongst the media and social media hysteria (on both sides), one could be forgiven for missing an intriguing narrative espoused by alternative voices that opts, rather than criticizing one candidate over the other, to reject both the neoliberal status quo and reactionary neofascist agendas that are the product of unfettered predatory capitalism. In Disaster Capitalism: Making a Killing out of Catastrophe, acclaimed Australian journalist Antony Loewenstein turns his passion for justice to deliver a stunning critique of the thriving disaster capitalism industry, in its many forms; the profiteers of privatized detention, militarized security, the aid industry and multinational mining are relentlessly skewered with style and poise, and their predatory tactics exposed. According to his narrative, Hillary Clinton is exactly the kind of neoliberal hawk that enables neofascist demagogues like Trump to rise, and allows predatory ‘businessmen’ like Trump to prosper. Both Presidential candidates are indeed invested in disaster capitalism, but Loewenstein’s tale is arguably one that focuses on the Hillary’s of the world; the trusted and experienced hand; the status quo; the Establishment. Disaster Capitalism is the story of Loewenstein’s journey into the belly of this particular beast. The book gives us an up-close-and-personal look at how corporations like Serco, G4S, Halliburton and their ilk profit from organized misery, perpetual conflict and the impacts of disaster, and how national governments and international organizations like the IMF and the World Bank are willing collaborators. In Part I, he takes us to Afghanistan, Pakistan, Papua New Guinea and Greece, exposing the various exploitative strategies employed to enrich the local elite and foreign interests, and the devastating effects on the majority of people in each country. In Part II, we visit wealthy Western democracies (Australia, the United States and the United Kingdom) that punish the most vulnerable in their societies while dictating economic conditions to the world, imposing taxpayer funded cruelty for private profit at home and abroad. This is an absolutely enthralling read; a must for the revolutionary; the dreamer; the activist; the teacher; the learner. Loewenstein has compiled a treasure-trove of evidence on his travels. His dismantling of the social and economic myths that enable predatory disaster capitalism is robust and compels us to action. He offers a “challenge to cherished beliefs concerning aid and development, war and democracy, and in particular the modern, borderless nature of capitalism.” (p. 14) For this reader, 3 key themes emerge; a dialogue around crime and punishment; a critique of the idea of benevolent corporations; and the grim reality that this is all part of a plan, a rigged system that empowers and enables predator capitalists to flourish. Judicial processes in the UK, US and Australia target the marginalized for what amounts to, essentially, punishment for being unable to escape their systemic disadvantage. Loewenstein unpacks the ideology behind this phenomenon and asks whether the poor man, the petty criminal, the asylum seeker or the drug user really deserve the punishments that are prescribed and who indeed benefits? What of the bankers that caused a global financial collapse? The CEOs of corporations that destroy the only planet we have? The heads of state that lied in order to enable the invasion and destruction of Iraq, leading to the destabilisation of the region and a current displacement crisis of epic proportions? Should not our justice system be designed to protect society from such individuals and the devastating consequences of their actions? Over the past 2 months, we have witnessed a brutal crackdown on drug sellers and users in the Philippines, since the rise to power of President Duerte. Summary executions on the streets have shocked the world, yet few official condemnations are forthcoming. While it is not difficult to imagine that many politicians and indeed members of the public might secretly support these abuses of power and share the President’s disdain for Article 10 of the Declaration of Human Rights, as Loewenstein finds in Australia, America and the UK, there is an infinitely more ‘subtle’ way to enforce the harshest punishments: through private contractors. In Australia, the UK, the US and Greece, Loewenstein exposes the fact that asylum seekers and migrants are also punished, most often without breaking any law. In Greece, he provides a rich cultural background of “not just economic harshness, but a culture that tolerated and celebrated exclusion.” (p. 69) In the grips of imposed austerity measures, the social fabric began to unravel and “Popular frustration was taken out on the most marginalized group in society: refugees.” (p. 72) The mandate for demonization of the vulnerable that was secured in Greece, as in Australia, was just one tactic used to ensure profit for human rights abuses across the countries that Loewenstein investigates. Time and again, Loewenstein finds governments all too eager to enable those corporations in a position to cash in. He details how the EU has become central in “funding, encouraging and pressuring EU nations to isolate and imprison asylum seekers.” He discusses the industries that have sprung up and thrived, often with the EU leading “the charge in working with corporations that have been very willing to develop and hone methods for repelling the desperate hordes.” As ‘Fortress Europe’ closes her borders, deals like that done between the EU with Turkey are sealed without a second thought for the human cost. Corporations and corrupt governments profit; the vulnerable are turned away and suffer. In Bougainville, PNG, Loewenstein meets members of the resistance against resource exploitation, and explores the shady relationships between corporate and political interests. The memories of violence fuelled by greed and repression do not fade easily. The health of the community and the environment have also been terribly compromised. “Environmental vandalism should not be the price tag for ‘progress’,” he pleads. How often are we outraged at government spending on weaponry and conflicts that we deem unnecessary, but hesitate to question the relationship between corporate interests and government policy and spending. Loewenstein reminds us that the war on terror represents one of the largest wealth transfers in history, with 4 trillion dollars to date being spent, with much of it going to ever-grateful Western contractors. The privatization of prisons and security apparatus is incredibly expensive, while all evidence shows that incarceration does not tackle societal problems that lead to crime, but rather reinforces them. The overwhelming message is that simply outsourcing your cruelty is a convenient way to avoid responsibility, transparency and accountability, while profiting corporations and manipulating the economy. Neoliberal governments would like us to accept the notion that corporations are ultimately benevolent entities that exist only to employ people, satisfy market demand and grow GDP. Loewenstein argues that “multinational corporations spent the twentieth century gradually reducing their obligations in the various jurisdictions in which they operated.” (p. 243) What we have now is unregulated, unaccountable and secretive private sector entities. Meanwhile, governments with dirty work to outsource are not left disappointed.Unfortunately, a willful ignorance of the sometimes devastating social impact of ‘business’ has allowed a mentality of self-righteousness to fester, completely detached from the suffering of people that stand in the way of profit, those targeted by governments for suppression and oppression, and the unfortunate citizens of countries outside of the US circle of trust, whose lives appear to hold so much less value than those of allies. Companies like DynCorp and Blackwater, despite having their abuses repeatedly exposed, thrive in this context. Loewenstein exposes, time and again, the fact that the global economy is dominated by anti-democratic and predatory forces that profit the wealthy and the ruthless. The revolving door between corporations, lobby groups and government is clear for all to see. This collusion between powerful actors fans the flames of crisis while selling market fundamentalism as the antidote and positioning ‘benevolent’ corporations to reap the benefits. In the U.S. the banks were bailed out while personal debt, and indeed poverty rates, soar. Loewenstein offers a stinging critique of a system rigged for the 1%, and the scandalous truth that in the US both major parties represent similar corporate interests while the media feigns ignorance. Indeed, liberal presidents have done little for the vulnerable other than make empty promises. Meanwhile, in Haiti, Loewenstein describes an environment of “canny capitalists sifting through the ashes of a disaster, looking for business opportunities.” (p. 109) His narrative of this historically vulnerable nation describes the strong 20th Century American support for successive brutal dictatorships, enriching U.S. interests and a local elite. We see this model replicated again and again in Disaster Capitalism, and indeed around the world as a key element of U.S. foreign policy. The example, in chapter 3, of the “devoutly anti-Communist” ‘Baby Doc’ Duvalier is particularly damning, who, “unlike the many African despots targeted by the Hague, remained a friend of the West and was therefore largely untouchable.” (p. 110) When the neoliberal agenda was challenged in Haiti by Aristade, the U.S. and local elite conspired to overthrow the government to restore ‘order’. In a similar vein, most development aid to PNG from Australia since its independence either found its way into the pockets of either the wealthy PNG elite or Australian corporations. Far from its claimed humanitarian ideals, Loewenstein says that the main goal of the Australian government in PNG was simply, “to ensure that Australian corporations had a ready market in which to turn a profit.” (p. 172) The denial of complicity with oppressors in the violent struggles of the 1980s and the patronizing attitudes displayed by Australian diplomats leaves a bitter taste. Disaster Capitalism pulls no punches in calling out both profiteers and enablers. Loewenstein exposes a shady cabal operating in plain sight; corporations that will not blink at the thought of misery, death and destruction as part of business as usual. Governments that outsource their most distasteful projects to companies that have neither conscience nor boundaries. A complete lack of transparency and accountability allows whatever abuses that are uncovered to yield few consequences for the perpetrators. The book is impossible to put down and rich with memorable lines. It will have the reader coming back to review the stories of friend and foe, of oppressed and oppressor. Loewenstein has skillfully articulated opposing positions, admitting his ideological bent where possible in the text and to those he meets in the field. It is sure to be a book both loved and hated, depending on the beliefs of the reader, for its honest storytelling. The accounts of his journalistic interactions give the book a very personal feel. Loewenstein shows us how accepting something terrible (e.g. abuse of asylum seekers, mass incarceration etc.) out of a fear of personal harm, insecurity or loss gives a perceived legitimacy to profiteers (perhaps the American elections will be a case in point of this mechanism, on both sides). He wrote the book to “shock, provoke and reveal.” (p. 16) The question is; once we know all about the profiteers of calamity, will we just carry on or will we fight for justice?